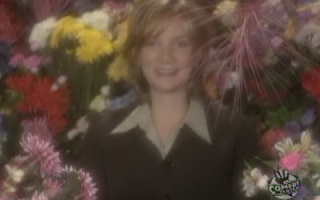 When I think of Beth Littleford, the first thing that comes to my mind are those hilarious mockumentary-type interviews she did with celebrities on “The Daily Show.” Who can forget the soft lighting, fuzzy camera filters, and lots and lots of flowers (mostly of the dried variety)? A lot of people have since copied her faux-interview technique, but no one has replicated it. If you don’t believe me, google “Beth Littleford David Cassidy interview,” and you’ll see what I mean. Now Beth co-stars as RJ Berger’s mom, Suzanne, on MTV’s cult teen hit, “The Hard Times of RJ Berger” (airing Monday nights). However, don’t let the “teen” moniker fool you. In preparing for my interview with Beth, I watched season one of the show online, and it is smart, wickedly funny, well written and well acted. You have time to catch up with the show before its May season-two finale, and I highly suggest you do. When I chatted with Beth recently, she told me all about this role, as well as her new summer movies coming out: “Crazy, Stupid, Love” with Steve Carell and “Movie 43,” with basically every single A-list actor in Hollywood. Celebrity Extra: I’ve been a fan of yours for many, many years, starting with “The Daily Show.” Tell me about the early days of being on such a boundary-pushing show. Beth Littleford: The Daily Show started out with a teeny tiny budget in like a corner of a PBS building. A small corner where no one had their own offices; everyone was in cubicles. You would laugh if I told you how much I got paid, and basically I was in the red spending the money on the suits and the dry cleaning and getting the nails done. CE: I just rewatched your interview with David Cassidy at my desk on my lunch break, and I had to cover my mouth almost the entire time to keep from laughing hysterically and disturbing my co-workers. BL: Thank you! To me there is no greater compliment than I had to cover my mouth to keep from laughing out loud. That’s a fantastic compliment and that is my life goal really, to make people laugh so hard that they have to cover their mouth so milk doesn’t come out or they don’t disturb and upset others. Most people do remember the David Cassidy interview. They love that. That to me was almost the straw that broke the camel’s back, in terms of I didn’t know if I could do that anymore. I couldn’t be that mean. But basically we were told by his publicist that if anyone deserves it, he does. He’s an unhappy man and he’s not a nice man, but I don’t want to judge anyone, because God knows it’s hard to grow up in this business. I don’t know what he went through and I don’t know his insides. But he certainly kind of asked for it. I’m much more of like a mushy, soft-underbelly sensitive soul than you would think, especially after having done four years of snarky. But you want to prove you can hang with hard-core comedy, so you’d better cut, and you’d better cut hard. CE: I noticed you took it a little easier on Jesse Ventura — is that because he’s such a gigantic man, or did you like him? BL: He is a charmer. You know I love the charmers. I was always charmed by Kato Kaelin. I was charmed by Todd Bridges. I was vaguely charmed by G. Gordon Liddy, which I was as shocked as you are. But most surprisingly, I really adored Jesse the Body. Most of the time, the interviews were a lot of fun: karaoke with Dionne Warwick and dancing with Boy George. Really, most of the time, it was fun, and only occasionally did it turn too cruel for my taste. But that’s the stuff that people remember the most. CE: On to your current show, “The Hard Times of RJ Berger”: Of course, I had heard of it, but I hadn’t seen any episodes until recently, thinking that because I am 38, it might not appeal to me. BL: Most people feel that way. But I have to say I think you will be surprised by the second season. CE: I agree: This show is so smart, funny and well written, it really is for all adult age groups. BL: Adults like us, I would assume would have no interest in the show. But I have to say, especially this second season, it goes really deep. It continues to push the envelope on a lot of levels, but there is also a lot of really hard, squeezing angst. A lot of no one’s what they appear to be, and life is more complicated. My character continues to be a little bit cartoonish, but then she goes deep. You see the love and you see the heartbreak. CE: When you were first presented with the show, what did you think about it? Why did you decide to do it? BL: In high school, either you feel like an outsider, or you’re in a lot of denial or you’re doing a good job pretending. Adolescence is a crazy time for that. So I love anything that explores that and explores that with honesty and depth, and although this continues to be a show about dudes just trying to get laid, it’s also a show about how the things we want maybe aren’t the things we want, and the efforts of just trying to do the right thing and fit in and find love and self-definition. Because the parents are regular characters this season, I get some juicier story lines. RJ’s dad and I get divorced. Basically, daddy lost his job two years ago but didn’t tell anyone and pretended to be going to work all that time, so he went through our entire life savings. We’ve lost the house, and he’s now in a fleabag motel and we’re in a little apartment. I’m just so angry and betrayed by that. It’s not your typical family, because we are swingers. So it’s not like he had an affair with the secretary kind of betrayal. It’s like, we were so open and so connected, and you have been living a lie for two years and you have driven us into the ground financially. So, we’ll see where that goes! There’s a big cliffhanger at the end of the second season. CE: Because “RJ Berger” is on MTV and not on network television, like “The Daily Show,” it must afford you all a lot more leeway as far as what you can explore in the series? CE: Tell me about one of the movies you have coming out this summer, the first being “Crazy, Stupid, Love” with Steve Carell. BL: I play the nosy, disapproving, neighbor friend of Steve Carell and Julianne Moore. I’ve seen it, and I can promise you that it is a fantastic movie. I laughed, I cried. It’s going to be, I think — please, God — I really think it will be just a beloved movie. I think audiences will love it. Great performances by these fantastic actors: Julianne Moore, Emma Stone, Ryan Gosling, Marisa Tomei, Kevin Bacon — I’m one degree of Kevin Bacon now! There is a lot of real sweetness, and everything is interwoven and comes back together. It's heart-wrenching and happy, but true betrayals of relationships and marriage and teenage crushes and all kinds of stuff. I can say honestly: Run, don’t walk, when that opens on July 29. BL: Who even knows what that’s going to be? It’s got the biggest cast in the history of Hollywood. It’s all these comedy guys that I know and have worked with and have come up with. And then it’s like Kate Winslet, Hugh Jackman, Gerard Butler, Naomi Watts and Liev Schreiber. I don’t know what it’s going to be, but I can’t wait to see it!